Bri Ribaj: Beppe Grillo, the Italian Stand-up Comic, Says: Basta, Already! Beppe Grillo, the Italian Stand-up Comic, Says: Basta, Already! I am interested in Italy on account of my personal history and as a result I follow the socio-cultural developments in the country with some measure of regularity. The following NY Times article attracted my attention today. It's on the politically and socially aware Italian comic Beppe Grillo. The Accounting-trained stand-up comic whose critical 'reading' of Italian politics can be traced decades ago and is well-known to Italians and many Europeans, is actively involved with social reform. Grillo is one of the best-known Italian bloggers and he has managed to evoke much interest among the young in Italy. He is encouraging young people to run for public office in an effort to engender good political reform. A lover of the internet, he is employing cyber space tools actively and his blog receives much daily traffic. Grillo himself is not interested in running for political office. His sole mission seems to be one of informing the masses about the political nature of things and why they need to be proactively involved with their government and the goings-on in the Palazzo Montecitorio, i.e., the Italian parliament. 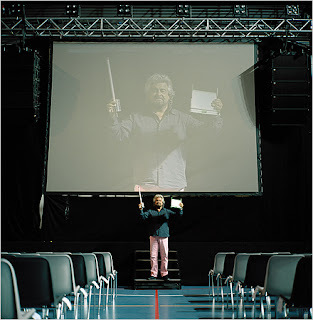 I suppose in the case of Grillo, we see an artist who considers art, in this case his stand-up routine, as functional to a specific socio-political mission. bravo, beppe. good example of the workings of democracy. anyone can comment on anything. beppe grillo said on the new york times bit that information is within easy reach in this new era, mostly thnks to the internet. Grillo did note that he is not anything special and that the fact that he is internet literate is allowing him to expose major socio-political problems in present-day Italy. I very much enjoyed reading about this, actually. But then I have also seen some of his stand-up so I might be biased somehow.